Thanks... and MVC on AML so far has been half-rez render. Maybe S912 will be first to support full MVC decode, full frame-packed render? Hope so. Found another Chinese S912 box w/similar specs. No ethernet and usb 2.0. Ugh. Not as impressive as I was hoping. Its one thing quoting Tech specs, its an entirely different thing having a AMLogic Box actually support these tech specs in the Kernel and drivers itself. These AML boxes are usually rushed to market full of bugs and dumped on an unsuspecting buyer seduced with a flashy website. This is Marketing 101 for Asian AMLogic box sellers, quoting Tech Specs as though everything just works straight out of the box. Notice it says "Supports HDR10/HLG HDR processing (software upgrade required)". AML S905 Firmware does not even have support for 10bit video output yet and that SoC has been out a while now. I would not be holding my breath waiting for this "software upgrade" to be forthcoming anytime soon from AML. Surprises do happen, but I doubt it. BTW Android TV 6.0 is only an Android TV App launcher interface for Lollipop or Marshmallow. I happen to have a test version of the Android TV launcher already running on a AML S812/S905. Getting proper DRM and Netflix Approval to run those nice 1080/2160p video streaming Apps is another thing entirely though. Well, as it was announced at Google I/O, it's more likely that it will have more support than most normal AML boxes. Also, being Android TV 6.0 means that it IS Marshmallow (not Lollipop) and there is a little more to Android TV than just the LL. I would be surprised if it was Amlogic, since Google is so damn picky about what SoCs can be used in official Android TV devices. For some reason Google has some reservations about AMLogic. The one very interesting thing with Xiaomi is they have been announced as an official Google Hardware partner, so it looks like this will be a legitimate Android TV 6.0 approved device and not just some hacked together Android TV 6.0 Apps launcher device. If it isn't a AML, then it probably isn't a Mediatek either unless their using a older SoC, since their newer Helio series SoCs don't use a Mali 450. But who know exactly what SoC it's using. It has pretty much the same specs as the Amlogic S905X chipset, except for processor speed. I had posted this over at SHIELD forum. Also posting here to just check whether anyone from Xiaomi is on Kodi forum. So another manufacturer and box that have no clue. That promise their box will do everything but in reality will not do very much. The market is so over crowded with all these crappy poorly supported boxes. (2016-05-20, 00:03)Mylo75 Wrote: So another manufacturer and box that have no clue. That promise their box will do everything but in reality will not do very much. I think it's more likely that their marketing people, who are probably not that familiar with english, just cut and paste what seems to imply quality. The box itself has official Android TV/Google certification, which means that it is much better than most cheap boxes from china. Here's a video I found where Hugo Barra (Xiaomi's Global VP) talks about the device. He doesn't go into any real detail, but you can see how tiny the Mi Box actually is. He also says that the product will be available within a few months and the price will be "pretty amazing". 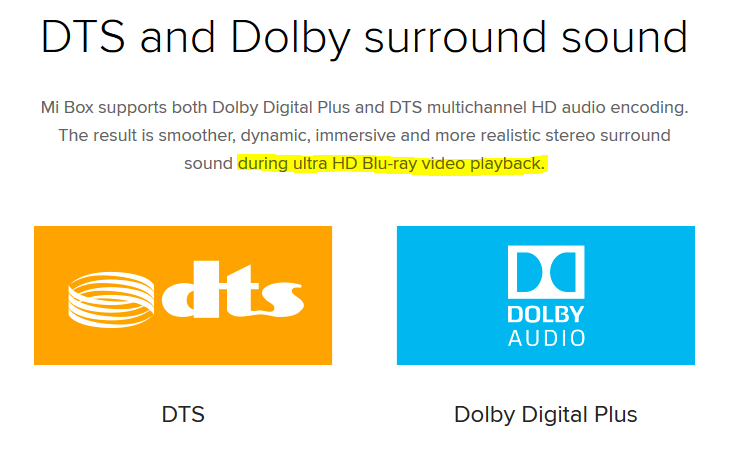 Looks like HDR is the new buzzword from TV Manufacturer, isn't it?